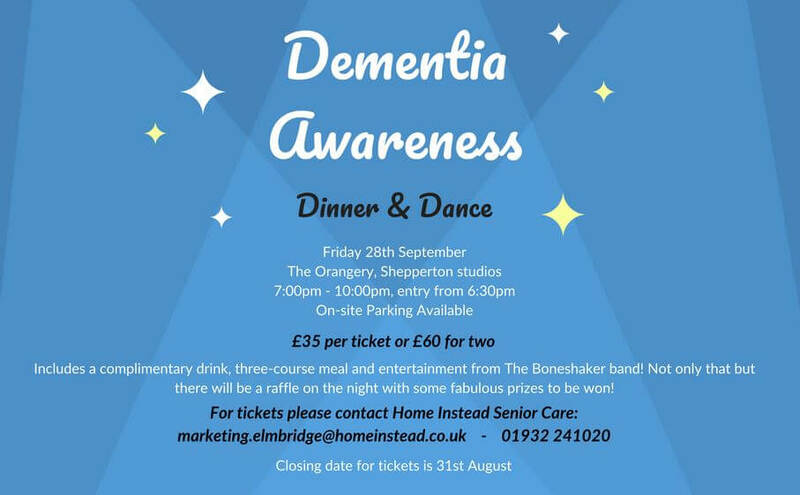 Shepperton Studios will play host to Home Instead Senior Care in Elmbridge for their Dementia Awareness Dinner & Dance, in collaboration with Music in Hospitals & Care. On Friday 28th September, The Orangery will be transformed into a dinner hall for guests of both local organisations, to enjoy a wonderful meal and some entertainment from frequent MiHC musicians, The Boneshaker band. This new partnership between MiHC and Home Instead hopes to benefit people in the local community who may be suffering at home, or caring for a loved one with various dementia related diseases. Where words fail, music speaks! With support from the R C Sherriff Trust, Music in Hospitals & Care and Shepperton Studios, this promises to be an event to remember, so remember to get your tickets soon! Please see the flyer below for more information. or click here for the full poster.